Splash page. 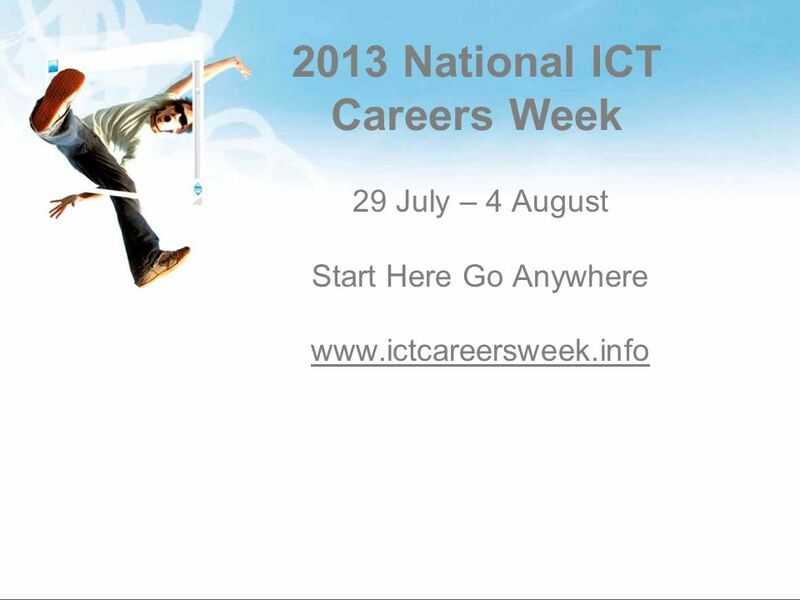 2013 National ICT Careers Week 29 July – 4 August Start Here Go Anywhere www.ictcareersweek.info. 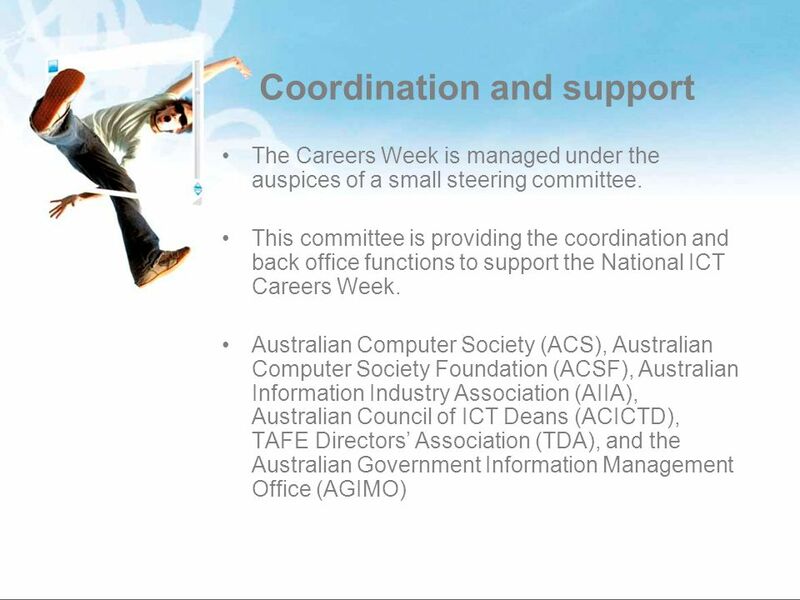 3 What is the National ICT Careers Week During one week from 29 July – 4 August 2013 and across Australia, we want to show the opportunities available to young people in information and communications technology. We want to encourage young people to consider studying ICT after their schooling and to consider a career in ICT. We want them to see studying computing and communications is the start to a rewarding, interesting and social career anywhere in the world. 4 Our reason for National ICT Careers Week ICT people are in demand Young people may not know that ICT people are in demand The Australian ICT industry (and its customers) require people with the appropriate ICT qualifications and training in the short and long term. Australian governments need people with ICT skills to add to the nations capabilities. 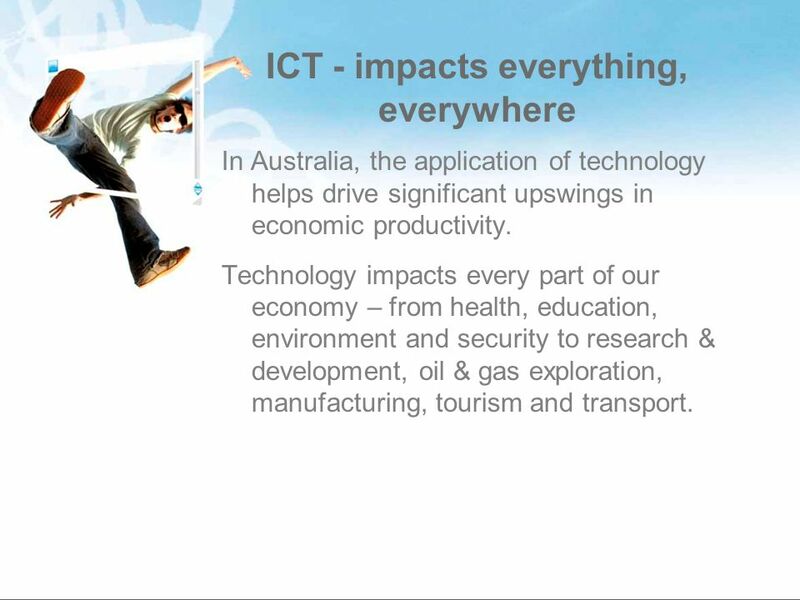 5 ICT - impacts everything, everywhere In Australia, the application of technology helps drive significant upswings in economic productivity. Technology impacts every part of our economy – from health, education, environment and security to research & development, oil & gas exploration, manufacturing, tourism and transport. 6 ICT connects with state and national priorities Our nation and state face many challenges in: Climate change & energy Global economic climate Investment in technologies Employment constraints Education Health Security An ageing population The application of ICT is vital for enabling the solutions to these pressing, key issues. 7 ICT - driving the Australian economy ICT is the fundamental driver of employment in both the ICT industry and across other industries, employing over 500,000 Australians. ICT accounts for around 7.74% of Australias total GDP (about the same as mining). Australias ICT revenue is currently around $82 billion pa. ICT contributes AUD$4.5 billion in export. ICT R&D is AUD$5.2 billion ICT jobs will increase by 14,000 & 21,000 in next two years The Australian ICT industry comprises over 25,000 companies. 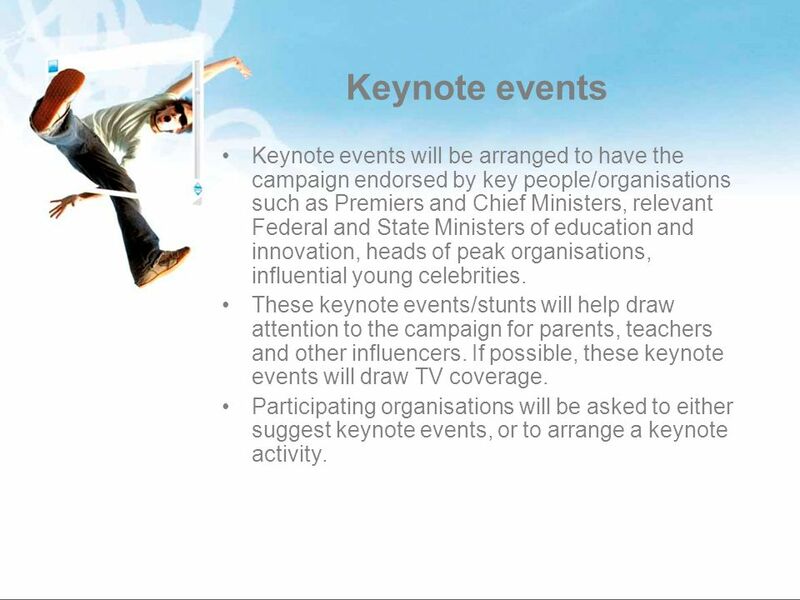 11 Keynote events Keynote events will be arranged to have the campaign endorsed by key people/organisations such as Premiers and Chief Ministers, relevant Federal and State Ministers of education and innovation, heads of peak organisations, influential young celebrities. These keynote events/stunts will help draw attention to the campaign for parents, teachers and other influencers. If possible, these keynote events will draw TV coverage. Participating organisations will be asked to either suggest keynote events, or to arrange a keynote activity. 12 Media engagement Journalists with interests in ICT careers and studies will be identified and contacted about the National ICT Careers Week. Participating organisations will be encouraged to use their existing media relationships. Journalists will be encouraged to contact the participating organisations to allow for individual media relationships for the National ICT Careers Week. Journalists will be briefed about the campaign, the participating organisations, and the collection portal. In addition, information and data on ICT employment etc will be provided so they have a common set of data points. 13 A single brand Participating organisations are encouraged to use the National ICT Careers Week banners to be recognised as a participating organisation. The immediate advantages of having single and national brand to market ICT study and careers to young people are that: the clutter of images associated with ICT marketing is reduced, and various groups can use the brand within a relaxed and distributed regime of deployment while achieving an overall integrated marketing appearance. Download ppt "Splash page. 2013 National ICT Careers Week 29 July – 4 August Start Here Go Anywhere www.ictcareersweek.info." Faculty of Computing, Engineering & Technology Professor Hongnian Yu Digital Economy Digital Britain. The Sector Skills Council for the Environmental and Land-based Sector Working in the land-based sector Madge Moore National Director - England Lantra Sector. Welcome from Inspired Youth Wifi – “The Space” – 5pac3j14. WHAT’S IN IT FOR ME? Some reasons for completing Year 12. Ian Birks CEO – AIIA 2009 Strategy Industry growth Industry leadership & influence A thriving, sustainable & influential information. Ray Pincombe LGMA National President Local Government Skills Shortage Forum 2009. PRIVATE SECTOR, ACADEMIA DIALOGUE BY MUDA YUSUF, DG, LAGOS CHAMBER OF COMMERCE AND INDUSTRY. Market Facilitation Strategy Industry engagement in a demand driven VET system CEET Conference October 2010 John Spasevski. 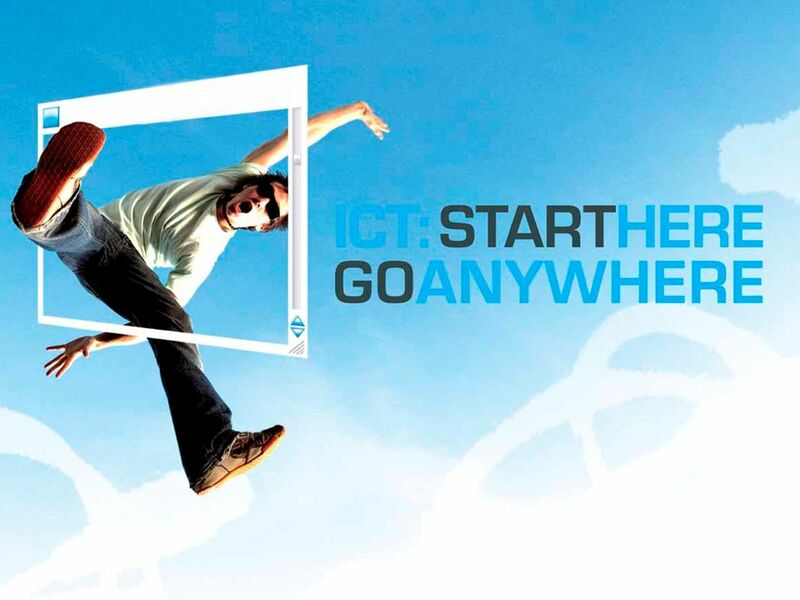 Smart ICT: Taking it to the World. Information Industries Bureau (IIB) Agency of the Queensland Government within the Department of State Development. Implementing a framework for employability Penny Renwick, Pro Vice Chancellor, Manchester Metropolitan University.